Ok, some of those stats are truely terrifying…Or at least seem wildly out of sync with people in general. I wonder what church use of the internet’s like in other countries? There are two major problems with this suvey. One, it defines “church” as staff, and two, it measured uses that were significant 8 or 10 years. 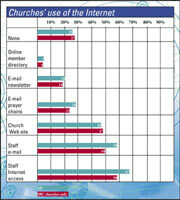 As you surely know, many church members use the ‘net daily. That church staff do so in much smaller percentages, is just another way to show how much they fail to communicate with members. I first attempted to get staff and members talking to one another over the Internet 8 years ago. Two years ago, I gave up and began connecting to other Christians already on the ‘net rather than beating my head against th same brick wall. Sometimes you gotta start over. Woohoo! Good for us! I’m a Presby! Why Don’t More Churches Use the Internet?